To be notified when concerts are scheduled, or new CDs are released, please email us to be added to our mailing list. Duke Ellington/Billy Strayhorn 1960 arrangements of Tchaikovsky: Nutcracker Suite & Grieg: Peer Gynt Suite. The Nutcracker Suite was released in 2013 on CD. in NYC of Henry Mancini's original score to Peter Gunn. 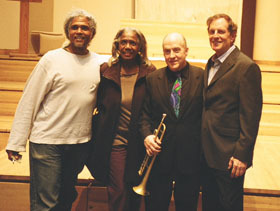 Noah and Anita Evans, Lew Soloff, and Steven Richman. One of HE/NY's most unique events took place at St. Peter's Church, NYC. Steven Richman conducted the Miles Davis/Gil Evans masterpiece Sketches of Spain, with renowned jazz trumpeter Lew Soloff, who played with Miles Davis and was soloist with Gil Evans and his orchestra. This historic event was attended by Anita Evans, Gil Evans' wife, as well as their son, Noah. The family of Bernie Glow, who played trumpet on the original 1960 recording, also attended, as well as Al Block, who played flute on the LP. George Avakian, original producer of the Davis LP, attended the subsequent recording sessions of Soloff, Richman, and the Ensemble. The HE/NY cd was released in November, 2010 to international acclaim. The Copland 80th Birthday Concert at New York's Symphony Space with both Aaron Copland and Mr. Richman conducting. 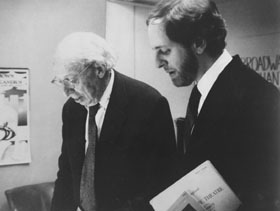 The concert was broadcast on National Public Radio across the U.S. A film, "Copland at 80, A Self-Portrait," including the composer conducting Harmonie Ensemble/New York, has been broadcast internationally. A gala orchestral Gershwin Commemorative Concert closing the annual Lincoln Center Out-of-Doors Festival at Damrosch Park. The program re-created Gershwin's final New York appearances at Lewisohn Stadium in July 1936. This memorable concert drew the largest crowd (10,000 people) in the history of Lincoln Center. It featured the first performances since Gershwin's lifetime of his original symphonic orchestrations, uncovered through the research and enthusiasm of Maestro Richman. 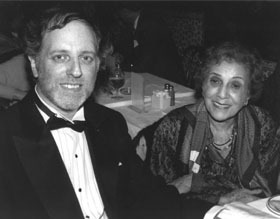 Frances Gershwin Godowsky (sister of George Gershwin) with Mr. Richman after the HE/NY Gershwin concert at Lincoln Center. Two Gershwin programs at Lincoln Center's Alice Tully Hall with works in Gershwin's original orchestrations featuring legendary pianist Leonard Pennario, and first winner of the Van Cliburn competition pianist Ralph Votapek. At the first concert, Gershwin's friend and colleague, composer Kay Swift, performed several Gershwin pieces. Miss Alice Tully and Kay Swift were honored at the second concert, which was also attended by Frances Gershwin, sister of George Gershwin. Martin Bookspan, "The Voice of the New York Philharmonic" was guest emcee at the concert and reception following. A Handel 300th Birthday Concert, at Damrosch Park including the first fireworks display in the history of Lincoln Center, featuring over 100 musicians from major international orchestras performing the original version of the Royal Fireworks Music for 24 oboes, 12 bassoons, 2 contrabassoons, serpent, 9 horns, 9 trumpets, 2 timpanists, and 3 side drummers; as well as the Concerto a Due Cori in F for 2 Wind Bands and Strings. The Ensemble performed a similar program at Alice Tully Hall earlier the same year. An orchestral concert for Lincoln Center Out-of-Doors marking the 70th Birthday of Leonard Bernstein, as well as the 75th of Morton Gould. This timely event drew a capacity audience, in addition to numerous dignitaries of the music and arts world. A special letter of recognition from New York's Mayor Koch was presented to Maestro Richman at the gala celebration (see archives). Dvorák Day, Sept. 13, 1997. 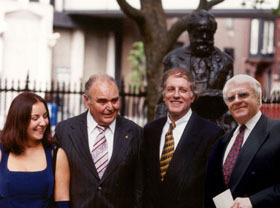 (Right to left) Violinist Josef Suk (Dvorák's great-grandson), Steven Richman, Antonín Dvorák III (grandson), Markéta Dvorák (great-great granddaughter) in front of Dvorák Statue, Stuyvesant Square Park, New York City. Conductor Steven Richman produced and conducted a series of Dvorák Statue Benefit Concerts to help place a statue of Antonín Dvorák in Stuyvesant Square Park, New York City. The great bohemian composer lived across the street from the square (327 East 17th Street, from 1892-95) and it was there he composed the "New World" Symphony and Cello Concerto, as well as other masterpieces. 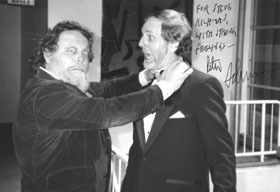 These events featured world-renowned ensembles and soloists including the Guarneri String Quartet, violinist Arnold Steinhardt, legendary baritone William Warfield, Czech Met Opera soprano Eva Urbanová, as well as Harmonie Ensemble/New York and members of the New York Philharmonic and Juilliard School Orchestras (see articles). The first concert, in 1994, included the world premiere performance of Dvorák's Octet-Serenade (the original chamber version of his String Serenade), as well as the 100th anniversary performance of the newly discovered Dvorák arrangement for baritone, chorus and orchestra of Stephen Foster's "Old Folks at Home." 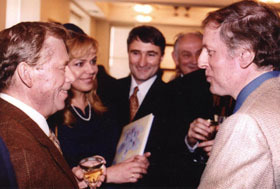 Portions of the concert were broadcast on National Public Radio across the U.S.
Czech President Vaclav Havel and Mrs. Havel (left) with Mr. Richman (right), at Czech United Nations Ambassador's residence, NYC. The project culminated on Dvorák Day, September 13, 1997 when a statue of the composer was dedicated in Stuyvesant Square Park. 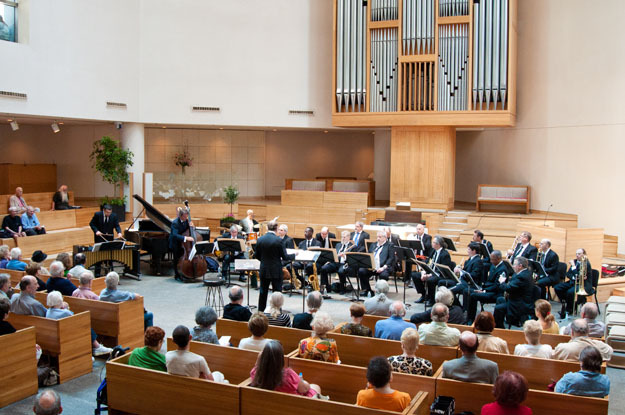 Mr. Richman conducted a gala concert in nearby St. George's Church featuring works composed in New York City including the "New World" Symphony and Sonatina for Violin and Piano. Violinist Josef Suk (Dvorák's great-grandson), performed. The composer's grandson, Antonín Dvorák III, and great-great granddaughter, Markéta Dvorák, attended the event, as well as the Czech Ambassador, the Lord Mayor of Prague, and film director Milos Forman. The Dvorák Day Concerts have continued as an annual event, featuring both Czech and American artists, and extending to include the music of the students of Dvorák's students: Copland, Gershwin and Duke Ellington. Artists have included the Eroica Trio, violinist Ivan Zenaty and pianist Radislav Kvapil. Stravinsky 100th Birthday Concert at the 92nd Street "Y," a critically acclaimed event celebrating the centenary of Stravinsky's birth and featuring a fully staged and danced version of Histoire du Soldat (The Soldier's Tale). Our Carnegie Hall debut in 1989, where HE/NY performed the Dvorák Serenade for Winds, Cello and Bass as part of a sold-out special benefit concert. In 2005, Harmonie Ensemble/New York presented a unique program of chamber music and songs by composer Kay Swift (friend and colleague of George Gershwin) and Gershwin. Miss Swift was the first woman to write a complete Broadway musical (Fine and Dandy, 1930); she also assisted Gershwin in copying and orchestrating Porgy and Bess. Members of the Swift and Gershwin families, as well as Kitty Carlisle Hart, honored us with their presence. A William Walton 100th Birthday program, including Walton's String Quartet in A minor, and Arthur Bliss's Quartet for Oboe and Strings. A congratulatory letter from Lady Susanna Walton, the composer's widow, was read to the audience. 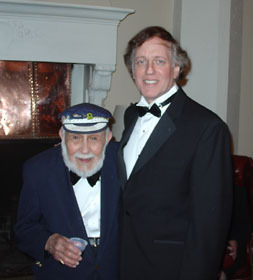 A 25th Anniversary celebration for HE/NY with a Symphonic Jazz concert in 2004 featuring Ferde Grofé's original orchestrations for the Paul Whiteman Orchestra of his Grand Canyon Suite and Mississippi Suite, not heard in 80 years. Also, Gershwin's Second Rhapsody for Orchestra with Piano in Grofé's orchestration, a true rarity, was heard, with soloist Lincoln Mayorga. The icing on the cake was Gallodoro's Serenade for Saxophone and Piano, performed by the work's dedicatee, the remarkable 91-year-old Al Gallodoro. A Merkin Hall concert including Ibert's Concerto for Cello and Wind Instruments. The program also included P.D.Q. Bach's Octoot for Wind Instruments and works by Beethoven and Milhaud. Professor Peter Schickele (who "discovered" many works by P.D.Q. Bach) took a bow at the concert. A special all-French 20th century chamber orchestra program at the Alliance Française in New York. Two symphonic concerts at Madison Avenue Presbyterian Church including the Cherubini Symphony in D (arr. Toscanini) and Saint-Saëns' Symphony No. 3, "Organ." A Lincoln Center Brass Salute, featuring Mussorgsky's Pictures at an Exhibition, arranged for brass ensemble and percussion by Elgar Howarth. Harmonie Ensemble/New York also plays concerts in smaller and non-traditional venues, such as Temple Emanu-el on Fifth Avenue (a Holocaust Remembrance concert), Manhattan's St. Peter's Church (part of their prestigious jazz series), and private and special events (including Vivaldi's Four Seasons at Tavern on the Green and incidental music for a reading at the New York Society Library). The Ensemble gives free performances in nursing homes, senior centers and hospitals, as well as annual choral and operetta concerts at the Lighthouse for the Blind. The group counts among its most important and fulfilling activities its young people's concerts, which have taken place at Riverbank State Park, the Bank Street School and many other locations. For a list of some of these and other concerts not included on this page, see the Archive section. This website and all content copyright 2008-2017 Harmonie Ensemble/New York  Website Design: Canfield Design Studios, Inc.